Uses the multitasking trend – As people move faster and consume media simultaneously, letting them get their news while something else is happening is vital. To date, that has meant making news content easy to port from one place to another so we can control where we read it. 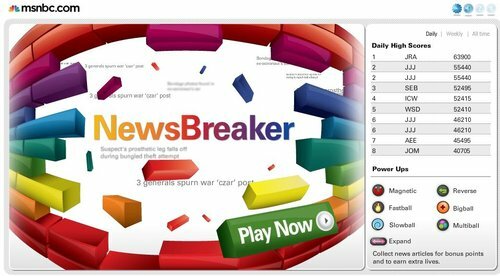 With the Newsbreaker game and screensaver, MSNBC takes the news content out of it’s usual cycle and puts it into a format where we can consume it while doing something else – like eating lunch, or walking by a desk, or playing a game. Fosters the forgotten art of discovery – When it comes to news, many people are forgetting the pleasures of discovery. That moment when you come upon a story that you might never have seen, tear it out of the paper (or bookmark it online) to save for later is rapidly disappearing. With RSS feeds, the casuality of convenience is discovery. We filter out the unexpected and miss the chance to see it. MSNBC brings that discovery back with Newstream and Newsbreaker, and make users realize how important it really is. Offers strategic value for NBC and fits the brand – The entire campaign and approach of producing a "fuller spectrum" is perfect for NBC because of the logo and brand mark mentioned earlier, but also because there is an increasing amount of scrutiny targeted at bias in media. Presenting a "full spectrum of news" seems to indicate, but it’s nature, that the news will be free from bias. People may disagree with whether MSNBC lives up to this ideal, but there is no arguing it as a smart brand positioning and place they would want their news to be. The only thing missing from Newsbreaker is a quick button to hit that pulls up an Excel spreadsheet if the boss is walking by and sees you playing what seems to be a game. Luckily for me, playing that game could probably be considered part of my job. Now all I need is for the folks from MSNBC to make this into a game for the Blackberry. Hours of waiting at airports and riding in Taxis is making me desperate for a new game other than Brickball. I hate when bricks are all the same colour.